Black Jack was a coal black Morgan Quarter Horse cross that was born on January 19, 1947. His only white marking was a small star. Black Jack was named in honor of General John J. “Black Jack” Pershing. He grew to stand a 15.1h and weighed 1,200 pounds. Black Jack was the last of the Quartermaster-issue horses branded with the Army’s U.S. brand. The brand was on his left shoulder and his serial number 2v56 was on the left side of his neck. It was clear from the beginning that Black Jack did not like to be ridden. According to Black Jack: America’s Famous Riderless Horse written by Robert Knuckle, Black Jack threw rider after rider into the dirt in the training corral. Despite his poor ridability, Black Jack was a handsome horse and his fiery spirit made him a favorite at Fort Reno. When the Army needed horses for The Caisson Platoon of the 3rd U.S Infantry Regiment (The Old Guard) Black Jack was sent to Fort Myer, Virginia. Black Jack Arrived at Fort Myer on November 22, 1952. It was immediately clear that Black Jack would not be suitable as a riding horse. Black Jack served in the Caisson Platoon of the 34rd U.S. Infantry Regiment (The Old Guard.) He served as the riderless horse in more than 1,000 Armed Forces Full Honors Funerals. Many of these were held at Arlington National Cemetery. Some of the highlights of Black Jack’s career included serving in the funerals of: John F. Kennedy (1963), Herbert Hooover, (1964), Lyndon B. Johnson (1973) and Douglas MacArthur (1964). Black Jack served 29 years on the military. He died on February 6, 1976 and his remains were laid to rest at Fort Myer. Black Jack and Comanche are the only 2 horses in United States history to be buried with Full Military Honors. The riderless horse, or caparisoned horse, dates back to Ghengis Khan’s Time. The Mongols and Tartars believed that the spirit of a sacrificed horse would follow his master to the afterlife. Although riderless horses are no longer sacrificed they still carry on the tradition that the deceased will be accompanied by their horse after death. 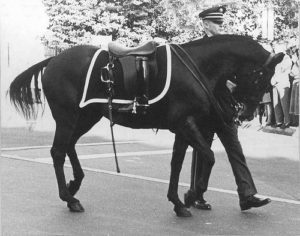 In the United States, the person must have achieved the rank of colonel in the Army or Marines to have a caparisoned horse participate in the funeral. The caparisoned horse has come to symbolize the rider’s last journey. Boots are placed backwards in the stirrups so that the warrior may have one last look at his family. 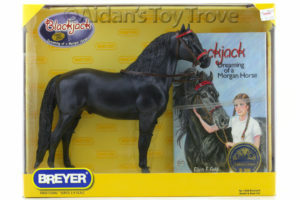 Breyer released at least 2 portrait models of Black Jack. Please let me know if I missed any and I will add them here. The Breyer 8134 Black Jack Resin was produced from 2002 – 2004. The Breyer 1288 Black Jack Model and Book Set was produced from 2007 – 2008. Black Jack was portrayed on the Justin Morgan mold. I do have 1 of these sets listed on eBay. 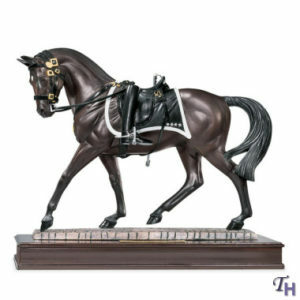 The Breyer 1134 Comanche is a portrait of the only horse other than Black Jack to be buried with Full Military Honors in United States History. 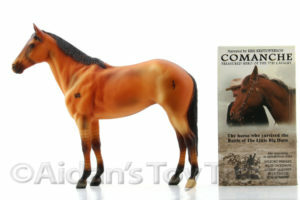 I do have a Breyer Comanche listed on eBay.